Forget the comfortable classic rooms on the back of the hotel—splurge on a deluxe room with a balcony or one of the bi-level suites, and make the most of that fabulous view. Oh, that view! The buildings of central Naples spill away down the hill at your feet, leaving nothing to obstruct the vista of the city's harbor and the deep blue Gulf of Naples beyond, bracketed by the islands of Capri and Ischia, where the Campania coastline curves out on either side. Perched on a hill not far from the heart of the city, this quietly refined hotel keeps its focus on high-end amenities and the high-flying panorama out its windows. The seafood and Mediterranean flavors at George's, the hotel's main restaurant, are even more savory when enjoyed al fresco on the terrace. Those who appreciate the high life will gravitate to the selections offered in the Cigar Corner and at the Champagneria, where top French vintages are complemented by appetizers such as quail eggs with mushroom salad or asparagus and salmon crepes. Such luxuries are right at home amid the hotel's antique furnishings and collection of original artwork. Just 82 guest rooms and suites, all with marble bathrooms, have classic touches like coffered ceilings and floor-to-ceiling windows (is that Vesuvius in the distance?). 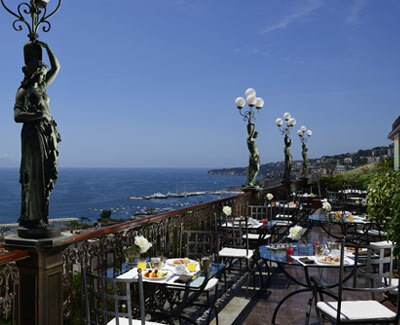 And, of course, the Grand Hotel Parker's is less than 20 minutes' walk from the exclusive central shopping district of Naples, and offers easy access to the myriad historic sites and entertainments of this lively city. Treat yourself to a taxi on the way back, and leave time to watch the sunset over the sea.